The Cannes Film Festival is an international showcase each year for the best films and documentaries. Many of the world’s most famous actors, directors and producers are gathered this week along the French Riviera to celebrate their work. Could tiny Denair be represented next spring? It’s possible. A team of documentarians will spend this week in Denair following three students from their homes through their days at school and back again. The idea is to create a 10- to 15-minute documentary – and perhaps a longer film version – that captures teen life in a typical rural American town. 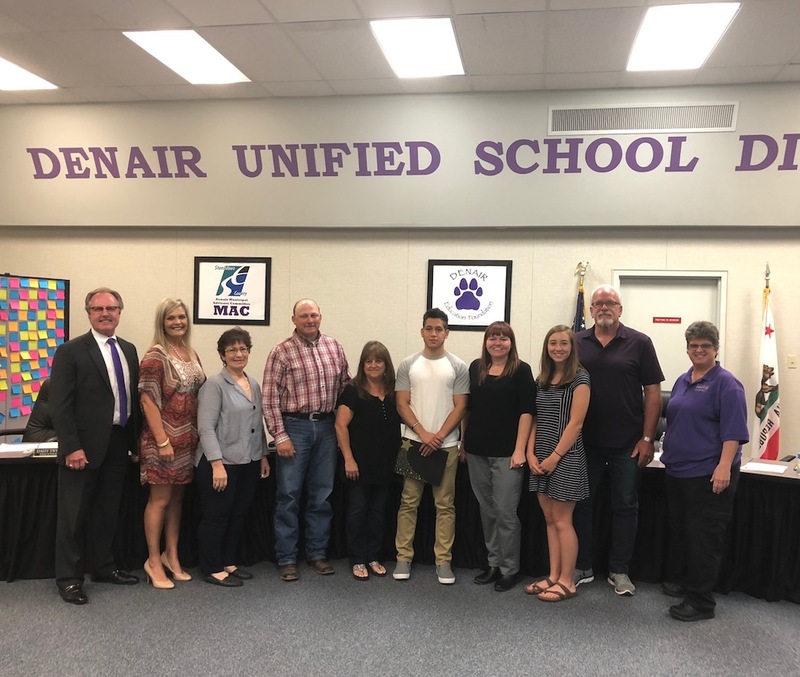 The idea was the brainchild of Denair High Principal Kara Backman, whose goal is to shine a positive light on the community as well as her campus. “We want to show the public how we open the doors of opportunity to all kids,” she said. Backman hired GoodCity Concepts from Cleveland to produce the documentary. She is familiar with their work, having seen videos they’ve created during her time as a national education consultant. Videographer Henry Ortlip and production assistant Kaytie Leonard arrived last weekend from the Midwest and began work Monday. They will be in Denair through May 20. Their mission? To portray eighth-grader Connor Prock, junior Adrianna Snyder and senior Alex Flores as authentic representatives of the broader student body and community. The students were selected with the blessings of their families. “What we’re trying tell is the worth of Denair via some inspiring story lines,” Leonard explained. 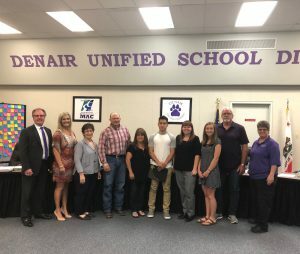 The Denair Unified School District didn’t have to look very far to find its next principal for Denair Middle School. Trustees voted unanimously Thursday night to hire Amanda Silva, who currently serves as the district’s assistant director of special education. “She’s dedicated to Denair. She empowers others. She’s forward thinking. She’s passionate about kids,” said Kara Backman, the district’s director of secondary education and high school principal. She served on the hiring committee will be Silva’s direct supervisor. Backman said Silva stood out among the seven internal and external candidates who were interviewed. Silva will become the middle school campus’ fifth principal in the past four years, a trend she intends to do her best to end. Silva has been with the district since February 2016 and has worked with staff and students across all four campuses to develop special education programs. She has a bachelor’s degree in psychology, and an administrative credential and master’s degree from College of San Joaquin. Confronting a steady decline in enrollment will be among her first challenges, she said. Technology permeates every classroom in the Denair Unified School District. It’s not a matter of if teachers and students will incorporate computer-based instruction as part of everyday learning, but how they will do it. From the earliest grades at Denair Elementary Charter Academy to middle and high school students across the street and across all subject areas, access to technology is an expectation, not a luxury. Every Denair student at every grade level has a district email account and access to Google Drive that allows them to log in in every class. They also can sign into their account from home to work on projects or complete homework. 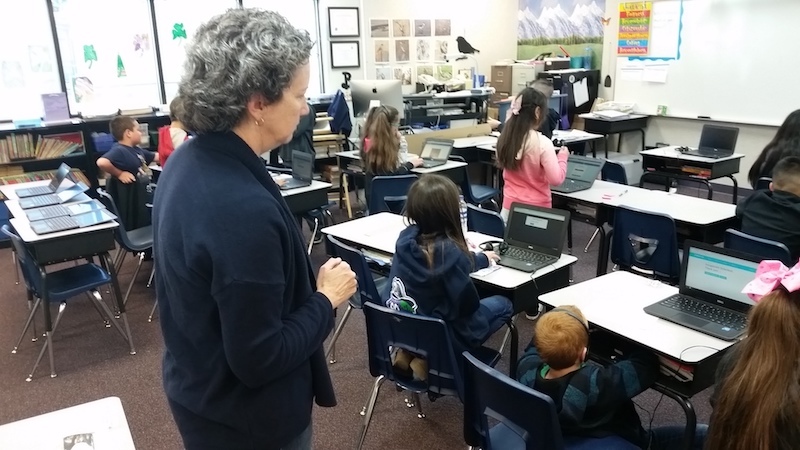 “These kids have grown up with technology in their hands, unlike any other generation before them,” said Mark Ranes, a former teacher who is now the district’s technology director. “Most were using mobile devices before they could write. They are wired differently than us adults. The district has invested heavily to get to this point. This year, it used nearly $300,000 in state funding saved over several years to add 18 Chromebook carts to its tech arsenal. The portable carts can be moved from class to class. Each contains up to 30 Dell Chromebook computers with charging stations. The new computers brought the district’s number of carts to 20, with another five in the pipeline for next year. Eventually, Ranes said, each student is likely to be assigned his or her own computer. Demand has been tremendous across the four campuses – DECA, Denair Middle School, Denair High School and Denair Charter Academy. The rollout was delayed until the district could upgrade its wireless network last fall. Once that was completed, the computer floodgates opened. Denair High School graduate Randy Jones talked about what it’s like being a civil engineer for the City of Turlock. Sarah Jennings of the Paul Mitchell School in Modesto extolled the possibilities of a career in the hair or skin care industries. Explorer Scouts Landon Zamora and Carlos Lerma discussed what it takes to become a sheriff’s deputy. 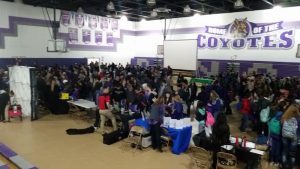 They represented just a handful of more than 20 potential career paths Denair students were exposed to Wednesday morning during an informative and wide-ranging College and Career Fair. The point, explained Principal Kara Backman, wasn’t to direct teens down any particular path, but to open their eyes to many different possibilities. Students from both Denair High as well as Denair Middle School participated. “We really want kids to figure out what their inner passion is and learn about the kinds of skills they need to develop to attain it,” she said. The presenters ranged from Turlock orthopedic surgeon Scott Calhoun (another Denair graduate) to a myriad of business owners, a real estate professional who also is a life coach, a police detective, someone from the manufacturing industry, dairy and almond farmers, teachers, an auto mechanic, a social worker, a welder and a dental hygienist. Students were able to sign up for three 20-minute sessions to listen, watch videos in some cases and ask questions. Jones, Class of 2005, told students how he turned a lifelong love of math and science into a career as a civil engineer. He talked about working together as part of a team to solve problems and create long-lasting solutions. His latest assignment, he said is an $8 million project to redesign 1.4 miles of West Main Street between Highway 99 and downtown Turlock. Next week is Red Ribbon Week at schools across the country. Red Ribbon Week began in 1980 as a way to discourage drug use among children while promoting healthy behaviors. Former First Lady Nancy Reagan was one of the original proponents. The campuses in the Denair Unified School District have a number events planned starting Monday. All are being coordinated by staff as well as student members of the PHAST (Protecting Health and Slamming Tobacco) Clubs. Monday: Crash scene. There will be a wrecked car on the grass near the student store unveiled about 8:40 a.m. The car will be an example of what can happen if people drink and drive, text and drive or are under the influence of drugs and drive. The car will be there all week as a reminder to students. A video was shared with students Friday to prepare them for what they will see Monday. During lunch, we will have games, music and prizes. Tuesday: Drug dog demonstration, games, music and prizes. Wednesday: California Highway Patrol presentation, games, music and prizes. Thursday: Hollywood-themed photo booth, games, music and prizes. Friday: Denair Fire Department presentation, games, music and prizes.